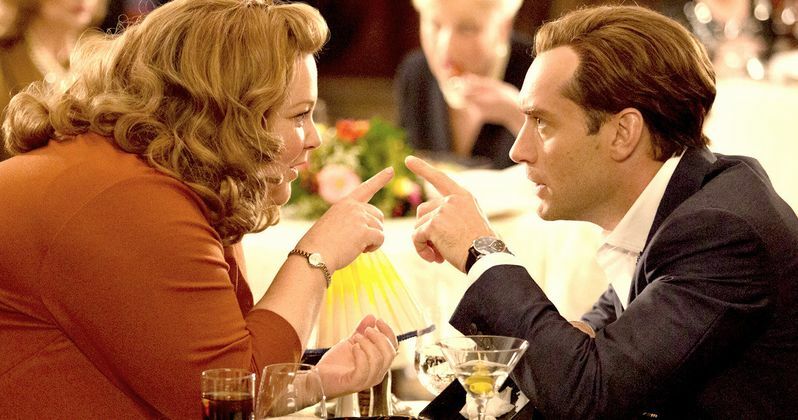 Behind every great spy is a woman in a basement office, which you can see in the latest clip from 20th Century Fox's action-comedy Spy, arriving in theaters June 5. Melissa McCarthy stars as Susan Cooper, an unassuming, deskbound CIA analyst, and the unsung hero behind the Agency's most dangerous missions. We can see her skills at work in this scene, where she uses surveillance photos and a strategically-positioned air strike to lead her partner, Bradley Fine (Jude Law) out of harm's way, in a rather ingenious fashion. This longtime desk agent is forced to go out into the field, though, when Bradley falls off the grid and another top agent (Jason Statham) is compromised. She volunteers to go deep undercover to infiltrate the world of a deadly arms dealer, and prevent a global disaster. The supporting cast includes Morena Baccarin, Allison Janney, Bobby Cannavale, Peter Serafinowicz, 50 Cent and Miranda Hart. Melissa McCarthy reunites with director Paul Feig for the third time, after successful collaborations on Bridesmaids and The Heat. They will also reunite later this summer when production starts on the all-female Ghostbusters movie. Check out the latest clip below before heading to your local theater to check out Spy.